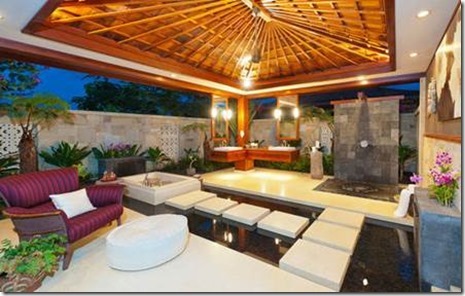 The backyard has always been recognised as one of the hot spots for entertaining and living. Whether it’s roasting marshmallows by the fire on a cool winter night or getting friends over for a BBQ on a sunny Sunday afternoon, outdoor living is definitely at its peak. Even as trends continue to come and go, outdoor entertaining still remains as popular as ever. Colours and styles will go out of fashion but the beauty of outdoor living – especially in Australia – stays strong. According to a recent survey porches, patios and decks are the most cherished paces of homes; with 69% of consumers adding a pretty patio to their backyard space. Find out what outdoor patio trends are in store for 2016. For your patio area to truly look complete, you need to get the right furniture look. For 2016, the natural look of Rattan and Wicker is back in fashion combined with clean lines and contemporary shapes. It has the ability to transform your patio into a modern outdoor living space and is durable enough to last the distance and weather conditions too. Think exquisite sun loungers, chairs, dining and coffee tables made of white fibreglass and Rattan to create that fresh, crisp Mediterranean look. Sofas and chairs should have a high back and padding to promote a high level of comfort and relaxation – perfect for summer days on your patio. Dress your outdoor furniture up with cushions, padding and throws in neon brights with naturally high saturation of colours to create a playful look. This pallet is great for fabrics, bistros, outdoor themes and patio furniture. Gable patios are still in front as the most popular option in patio designs. 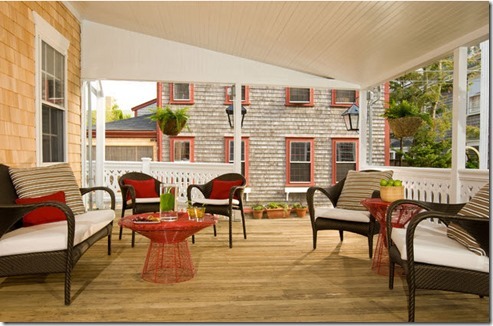 Flat roof patios have been declining in attractiveness for a while now as designs like gable are more in vogue. In comparison to standard flat patio roofs, gable designs have much more overhead space to ensure outdoor areas don’t have that horrible closed-in, claustrophobic feel. Gable patios can help a small space to appear larger with the arched height and have a variety of attractive designs to suit all homes. Dome patio designs have also been booming in popularity with their soft curves and complete protection. Dome patios use curved sections of metal or other materials to produce the desired shape and can complement your home’s architecture beautifully. Whilst they tend to have a more unique design than gable patios, they can have a tendency to trap in more heat because of the curve so be wary of this when choosing the best design for your needs and location. Above anything, make sure you chose a patio design that offers a sufficient amount of shade to boost comfort levels and all-year-round use. Merging the indoor world with outdoor living is by no means a new thing, but this home design trend is set to boom even more for 2016. It doesn’t matter whether you are living in the city suburbs or nestled out in the country, the indoor/outdoor living trend works with any home design. Think dining areas that open up to your patio area, a stone fire place or fire pit to make the space versatile for the cooler months and decked out with sophisticated features like built-in speakers and audio and visual equipment for the ultimate entertaining and outdoor living experience. This open space concept is a design that homeowners are craving for in 2016. The flow between your indoor and outdoor space is an important part of merging these two worlds together so opt for a patio design that works with your home’s current appeal. Complementing colours and design schemes will create that seamless look between the two, even if your patio area is new. Whilst you definitely want the colours of your outdoor patio space to complement your home’s exterior, adding fresh pops of colour will brighten the space. Aqua blues and teals are in for 2016, creating a feeling that’s fresh and welcoming. 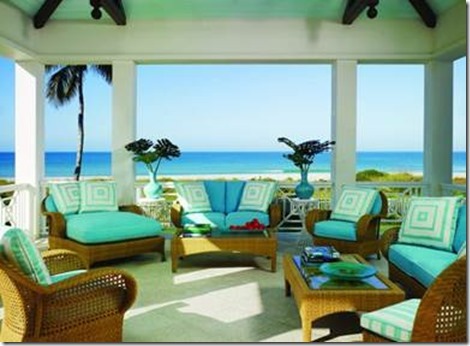 Complete the look with ocean creatures like beach house seashells, which are set to be a part of outdoor furniture too. In addition to the bright numbers mentioned in the first point of this article, Tuscan colours and excessive patterns are out for 2016. As people grow tired of Tuscan inspired blends and patterns that are too busy, outdoor designers have advised to keep things a little simpler. Instead, add interest and texture with natural greenery and pops of citrus colours and neon brights. Solid colour choices for pillows and throw blankets are in fashion for the New Year, too. Other colours to watch out for include berry, greys, mango infused orange and vanilla white. Mixed material trends are one of the best ways to integrate your indoor/outdoor living space together. In 2016, outdoor living is focused on mixing materials to create contrast and promote a dynamic interplay to outdoor living spaces. Look for patio furniture and outdoor decors that mixes resin with wood, wood with iron or teak with stainless steel. Natural materials are super-hot; like stone, copper, wood and wicker, and play into different design themes like vintage, rustic and environmentally friendly. This trend of mixing materials has been growing significantly over the year with more homeowners moving away from the matching styles. Don’t be afraid to get those creative juices flowing and blend different textures and colours together to create a unique yet cohesive design that’ll give you patio an updated look and feel. Which 2016 trends will you be incorporating into your patio design? 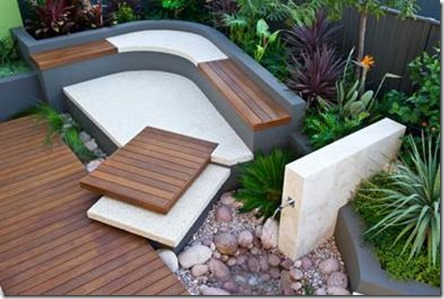 This article is written by Jayde Ferguson, who writes for Great Aussie Patios – Perth’s leading patio builders with a solution for every outdoor space and trend. You can catch her on Google+.